Among the best software development companies which believe in solving business solutions is HTS solutions. This firm is one of the best in delivering services to the clients and customers. The developers are absolutely fine and make good quality software. As software Development Company the workers of HTS believe in making the work easy. Making choice for the right kind of software is a very big decision. The trained developers make the websites and software exceptionally well through business initiatives. The main purpose of the company is to develop custom software application to serve the end goals of the clients and customers. The desired business needs can be solved by the people working for the customers. In the past there are thousands of business entities which have got its problems solved by using the services of HTS solutions. The products of HTS solutions include LiveChat99, Monkeycrm, and Gethrm and Hippomail. This company is adept in solving various tasks like employee management, performance management. Among other things include payroll attendance and recruitment etc. HTS solutions provide customised software to their client which helps in solving all the business problems with great ease. One can note the features of HRM and these are employee management, attendance management, salary management, and company management. One can have a free trial with the HTS products and see what the difference that it makes. It is a very superior software development company which makes a difference when it is chosen. 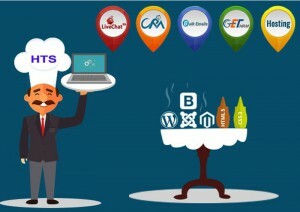 The web users can have an instant connect with the users of the web. The able and well trained professionals make the business work good and easy. Therefore, it is the best business solutions providing companies in the current times.